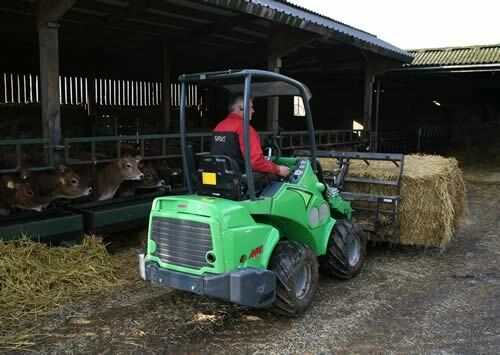 An Oxfordshire based dairy farmer has discovered the many benefits offered by an Avant compact tool carrier following its purchase as a replacement for an ageing skid steer loader. Jersey Manor Farm near Bicester covers some 350 acres and is home to a herd of 120 pedigree Jersey dairy cows and 150 followers managed by father and son duo, Ian and Tim Corner who utilise a Lely robotic milking system. Commenting on the purchase of an Avant 635 model from local dealer Ashlea Equipment Sales, Ian Corner said: “We’re over the moon with it and now use it every day for a wide variety of cleaning and feeding tasks in confined areas where it is not possible to gain access with our large 7 m reach telehandler. The 635 is one of a range of compact tool carriers and attachments available from Finnish manufacturer Avant Tecno. This model is powered by a reliable and economical Kubota diesel engine developing 28 kW (37.5 hp) and features an articulated chassis and 4-wheel hydrostatic drive which provides outstanding manoeuvrability and traction at all times.